A Dragons Story Slot | UK Review and Best Casinos to Play! If you’re searching for a brand new online slot game to play, A Dragons Story slot could be the one to try. Some slot games don’t bother too much with a story, but this one does have some semblance of one in place. You won’t see the knight too often, but when Sir William does appear, you’ll be glad he did. 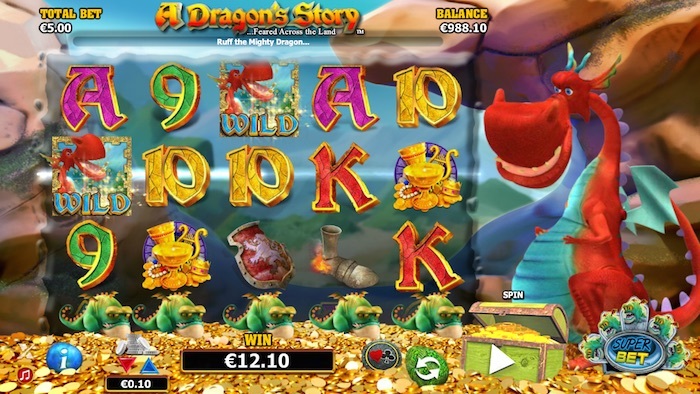 The Dragon’s Story slot is a five-reel, 25-payline game with lots of striking features. You appear to be in the dragon’s lair, but since he seems friendly this isn’t too much to worry about. The little dragons nosing around in the coins are worth watching, because they are connected to the SuperBet feature. Click that and more dragons will pop up to indicate which reels have the SuperBet attached. SuperBet offers an additional wager, putting dragons below one, three or five of the reels as opposed to when it is turned off. Sharp isn’t the word for it – this online slot has amazingly-good graphics. They’ve also mixed a good palette of colours together for this one, which does make everything pop out. Even the pay table is very detailed, providing all the info you need. The pile of gold coins at the bottom of the screen adds depth, and the reels are situated behind that. The 3D dragon is actually really cute – not frightening at all (at least, we didn’t think so). Click the treasure chest to spin and it jumps as you do so. 3D is hardly new now in the world of online slots, but it does still make a nice addition to this game. A Dragon’s Story shows how it can be done well. The dragon in NextGen Gaming’s Dragon’s Story slots is wild and will substitute everything else you see except for the usual scatter. This is represented by a purplish jewel in this particular slot. Get five of these and 2,500 coins will be yours. A variety of symbols are included in the game, including a scorched boot and a shield, clearly lost by the hapless Sir William, who may also appear. He has obviously faced up to the dragon, and – by the looks of it – lost. Well, you can’t have everything, but as you’ll shortly see, it might be nice to see Sir William from time to time. You’ll remember we mentioned Sir William the knight above. He can appear if you play for real money – a feature that happens entirely at random. The idea is you have to send a fireball in his direction, which causes him to drop some of the treasure he is carrying. The more he leaves behind, the more you will win in this nice little bonus addition to the NextGen Dragon game. 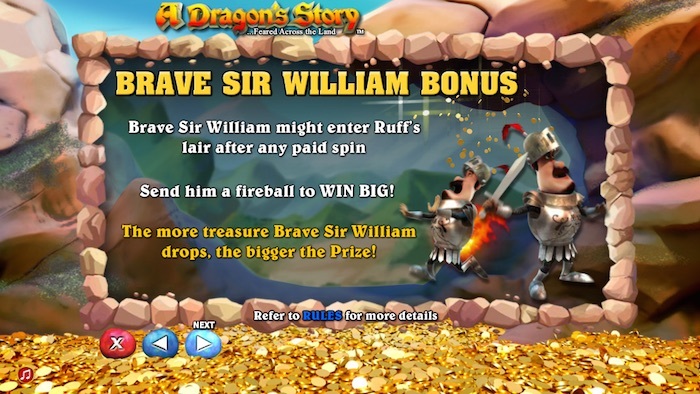 The other bonus feature A Dragon’s Story slot has to offer is the free spins round. This is accessible if you manage to get at least three of those purple jewels mentioned earlier in our review. You’ll get 10 free games with at least three of these. As is common in free games features, there are double-value prizes to win. It is also worth noting that playing the SuperBet feature means you have a chance of seeing the Little Dragons burning some more wilds into the reels during the free spins. This happens in the regular game too if you decide to use the SuperBet feature. Just remember you are increasing the bet amount by using that feature, although it does give you more wilds that could lead to more prizes. You have to weigh up whether or not it is worth it. This NextGen slot is great for anyone who likes to keep their bets to a minimum. You have to play all the lines here, so just use the red down arrow or the blue up arrow to get to the line bet amount you are happy with. This will range between a penny and £2. This game hasn’t been out for long, but the RTP is clearly indicated right at the end of the pay table for the game. It will vary depending on whether you have the SuperBet feature on or off. If you don’t use it, the RTP is about 95.22%. Players who do make use of it can expect an RTP of 95.61% for the maximum SuperBet level. As new online slots go, the Dragon’s Story slot does tick a lot of appealing boxes. Perhaps best of all is the humour that is clearly included here. We hate to draw attention to it, but when Sir William does show up and you choose a flame to hit him with, you can watch him running round in circles for a bit. It’s quite fun and nice to see him drop some prizes for you as well! If you have a moment, check out the free version at the very least – we think you’ll love it.